Michael I. Darter, a professor emeritus of civil and environmental engineering at Illinois, speaks after being presented with the American Concrete Pavement Association 2017 Hartmann-Hirschman-Egan Award. Photo provided by the American Concrete Pavement Association. Darter was recognized for his innovation, leadership, teaching and mentoring in the field of civil engineering, as well as for his advancement of technology that has resulted in countless numbers of high-quality concrete pavements. 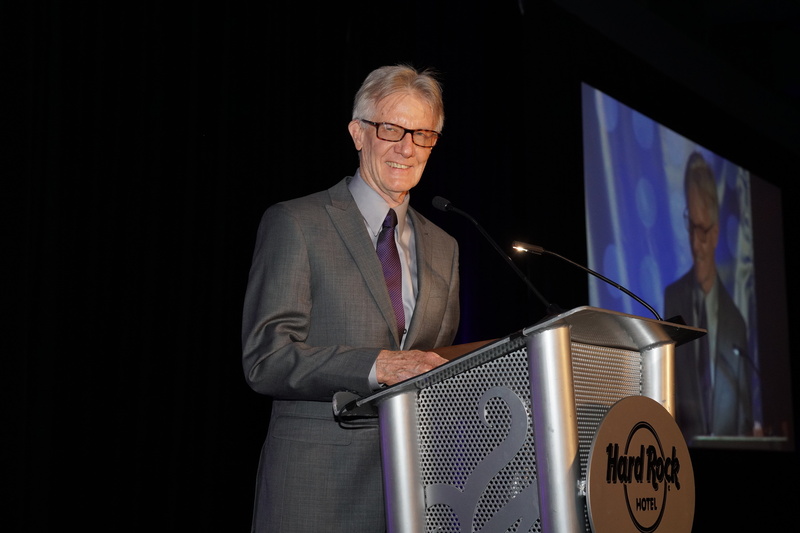 “As an authority on design, construction, rehabilitation and management of concrete pavements worldwide, your contributions have been innumerable, far-reaching and enduring,” said ACPA President and CEO Gerald F. Voigt. Voigt, along with many others in the concrete pavement industry, have been students, colleagues or mentees of Darter. The American Concrete Pavement Association is the national trade association for the concrete pavement industry. Darter’s 40-plus years of consulting, research and teaching have resulted in a legacy of exceptional pavement engineers and in engineering tools used in all facets of concrete pavement design; evaluation and forensic analyses; performance prediction modeling; performance-related specifications; life-cycle cost analysis; and rehabilitation procedures. “Among the most noteworthy is your achievement as principal developer of the AASHTO Mechanistic-Empirical Pavement Design Guide, the most comprehensive tool for concrete pavements in history,” Voigt said.